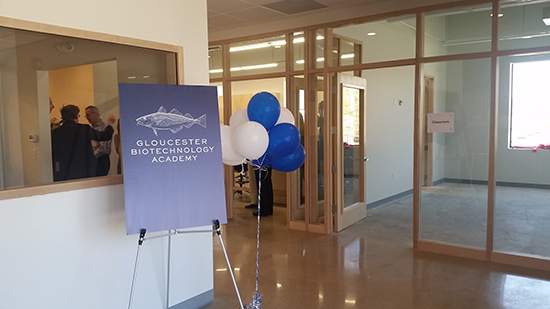 The Gloucester Marine Genomics Institute (GMGI) celebrated the opening of their new Gloucester Biotechnology Academy on May 14. 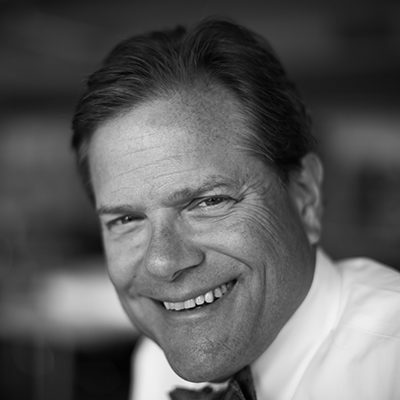 The research space for the new cutting-edge vocational program was designed by Payette Principal George Marsh, Jr, FAIA. The program will provide recent high school graduates a one-year technical course in marine-themed curriculum including a paid internship at a local biotechnology company during the final three months of study. GMGI currently has 10 applicants for the maximum 20 spots in the inaugural class which is slated to begin the first week of September. The first year at the Gloucester Biotechnology Academy will be free of charge for the students. The design of the research lab has a notable element of public engagement which is represented in the gallery-like corridor that bisects the program. The space slips between large teaching spaces and smaller, more intensive lab support rooms. Glass walls at each end of the gallery provides transparency into the large teaching spaces reinforcing the researchers’ connection between open lab and lab support while inviting visitors to observe the research as it is being conducted. The lab support spaces are oriented in a bar that runs parallel to the main corridor and contains a sitting areas, a DNA Prep lab, equipment storage room and restrooms. Opposite the main corridor, the large teaching spaces include a teaching lab and a conference room, creating a wider bar of bright, tall volumes with exterior windows and generous floor to ceiling heights. Next to the conference room is an office which is also adjacent to the entry and has a line of sight down the length of the main corridor. Maple casework and curtainwall frames give the space a warm atmosphere. The exposed concrete floors give an industrial attitude. Hues in the carpet tile flooring located in the conference room and office pick up on accent walls at the entry and far end walls of the lab complimenting the maple finishes and matching GMGI’s branding scheme. 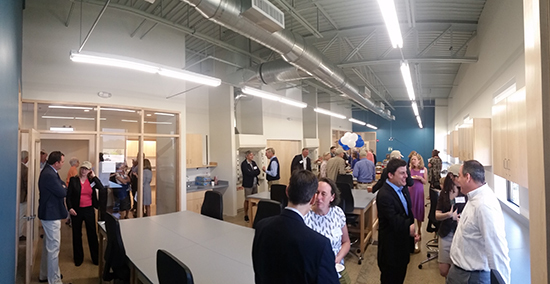 We are proud that our design of the new research lab at the Gloucester Biotechnology Academy will be home to new exciting research initiatives and opportunities for the community of Gloucester.